The three Time Sensitive Emergency cases we track closely are Stroke, Trauma and STEMI. There are numerous other items that we also track and monitor but these types of cases can provide a snapshot into others, have published standards and can be compared to other agencies to see where we fit in. One of the items we track for these cases is ambulance scene time. The goal for all three of these types of calls is 15 min or less at 80% of the time or better. VBEMS has shown an improvement in all three call types so far this year! Let’s keep up the great work, get those times down, and continue toward our goal of 80% in each category. We should also continue to work on including the correct and most appropriate primary impression or documentation selections. Trauma case scene times are tracked by meeting the CDC trauma triage criteria. If your patient doesn’t meet any of those criteria or the cause of their condition is medical, select not applicable in Elite. Example-Patient has a seizure and a small cut and bump to the head. They are post ictal with a GCS of 11 but gradually wake up through the call. This patient had a low GCS from the seizure, not the laceration. Trauma patients who meet these criteria should be transported to a trauma center (barring cardiac arrest or airway issues) such as CHKD, VBGH, or SNGH. 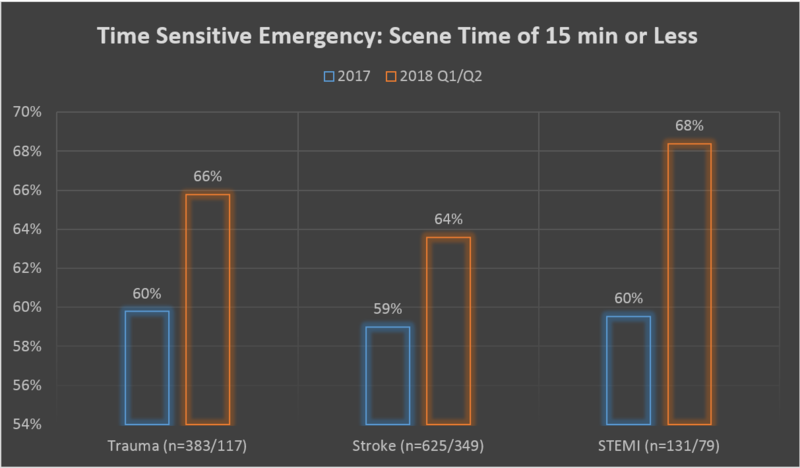 STEMI case scene times are tracked based on primary or secondary provider impression of STEMI. Other cardiac and STEMI goals may be triggered based on primary impression alone or hospital data. STEMI patients should be transported to a STEMI center (VBGH, SLH, CRMC). Stroke case scene times are tracked based on primary provider impression. If you suspect a new stroke or TIA is the cause of the 911 call today, select Stroke. Patients with a primary impression of stroke should be transported directly to a Stroke center such as VBGH, SPAH, SLH, or CRMC.